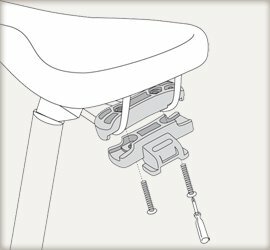 Our seat post Saddle-Bags and Micro can be fixed to numerous saddles with the included mounting system. 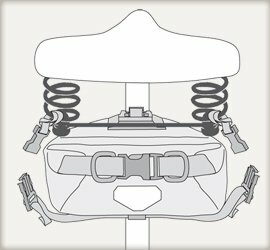 For mounting the adapter the two plastic parts with screws must be fixed between the two rails of the saddle (see drawing below). The distance should be between 45 and 60 mm (1.8 and 2.4 in.). For the model Saddle-Bag we offer a strap set (article code F96E) which allows mounting to comfort saddles or saddle with incompatible rail distance (e.g. Brooks) (see drawing below).